If there is one thing I absolutely love about our Facebook Community it is the awesome questions that come up from men and women on their own journey to reclaim their health by transforming their diet. There are few things I love more than doing what I can to answer questions, provide information and help as many people as I can to lose weight. 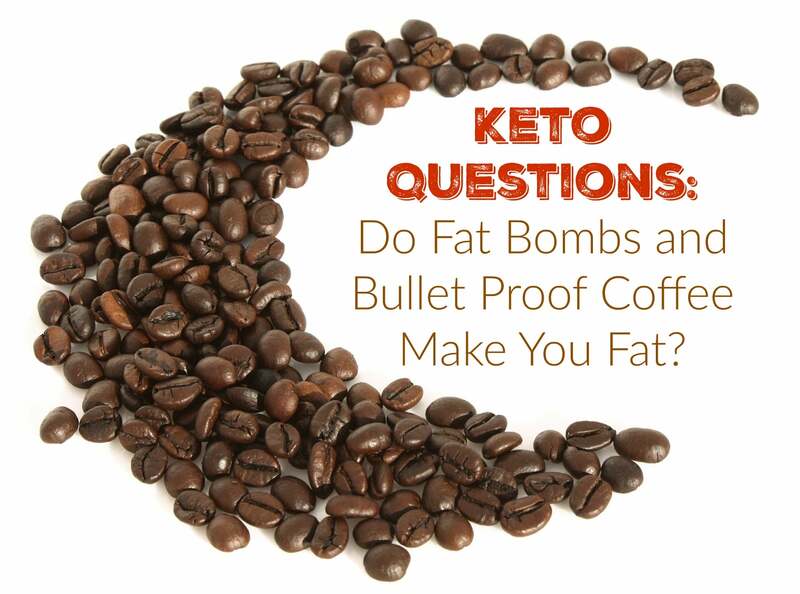 One question I get is how fat bombs and bullet proof coffee it into a ketogenic diet and whether or not it will slow or stop weight loss. The answer might surprise many people because the answer is it absolutely could, especially if you are already overweight. What Are Fat Bombs and BPC? We should stop for a minute and discuss what fat bombs and BPC are just so we are all on the same page. Fat bombs are sugar free treats like my Lemon Fat Bombs or Chocolate Fat Bombs that are high in fat are usually meant to be a little snack or dessert. BPC is coffee that has butter, coconut oil, or MCT oil blended into it in order to up the amount of fat you are taking in. I know BPC might sound a little strange if you’ve never had it but trust me, it tastes amazing. Now let’s look at how your body metabolizes all this fat so you can understand exactly why it might cause you to stop losing weight. The slightly dumbed down version is that fat is absorbed in the intestines as chylomicrons and pass through the lymphatic system in to the bloodstream where the are used as fuel or stored in fat cells. As fat cells fill up, the hormone leptin is triggered which makes you less hungry and you stop eating. However, this process breaks down if you are overweight because if you are overweight, then you are almost by definition leptin resistant. So as you eat more fat and your fat cells begin to fill up, you don’t “hear” the leptin signal, your appetite doesn’t turn off and you continue to eat more fat. As this fat continues to be stored away, you will gain weight unless you work to use the excess energy with exercise. The key here is your leptin resistance. If you are of a normal weight, you probably don’t have leptin resistance and you can eat fat bombs and BPC because you will fell full faster and stop. But if you are overweight, chances are you will eat more than you should and either start gaining weight or maybe just stop losing. I am convinced that these high fat snacks are responsible for derailing the weight loss goals of many on a ketogenic diet. So what do you do? How about you just eat real food until you fix your broken hormones? Instead of snacking and adding unnecessary fat to your meals, what if you just ate until you were satiated and then stopped eating? Maybe switch to plain ole black coffee? Perhaps you should even consider skipping a meal and mixing in a little Intermittent Fasting to your routine. I think there might be something to be said for using BPC or fat bombs to skip a meal. For instance, using the butter in your coffee to satiate you until lunch. But if you are drinking BPC along with a full breakfast of eggs, bacon, cheese and whatever else you are eating, that’s probably too much if you are leptin resistant. Or if you feel like your day ins’t complete until you have a dessert, perhaps you work on breaking that habit instead of eating a fat bomb. Remember that the key here, especially in the early days of a ketogenic diet when you are trying to get your hormonal house in order, is to eat real food to satiation and then stop. There is really no need for fat bombs or BPC while you are struggling to lose weight and it will be very helpful for you to break the habit of always needing to have food in your mouth. Calm down, take a deep breath and walk away from the food. PREVIOUS POST Previous post: The My Sugar Free Podcast – Episode 30: Dr Nadia and Intermittent Fasting! NEXT POST Next post: 3/16 Weightloss Wednesday: Time For a New Pair of Pants! Have you heard of Schwarzbein Principal? I’ve been reading her book and thought after I get to goal maybe eat that way? Family and friends have frowned upon the fact I’m losing weight faster than any other diet. They don’t think this is good Keto/LCHF/Atkins…..but it is working and I’m not Hungary all the time!! !What do you think? Thank you for all your awesome information, it keeps me going, gives me ideas, it’s inspiring!!! Yes I have and it appears to be very similar to what I believe except she advocates more “balance” with a few more carbs and I really think the benefits of being in ketosis outweigh and enjoyment I might get from the occasional sweet or carbs but I certainly wouldn’t begrudge someone doing that after their health and weight is where it needs to be. But the key here is to lose the weight first, then start making adjustments. Thanks, Oh I do drink BPC every am 6ish, not needing food til 2pm usually. It keeps me full, once I had my coffee and did eat a small breakfast, that was foolish!My stomach didn’t need the food, it was full. Thanks again for your support! I don’t feel quite alone on this journey lost 60 still need to lose 86 for goal. I also forgot to say, I’m so happy you found us! I always like hearing how I’m helping people fix their health.